You remember last month I posted about my liking for cel-shading? 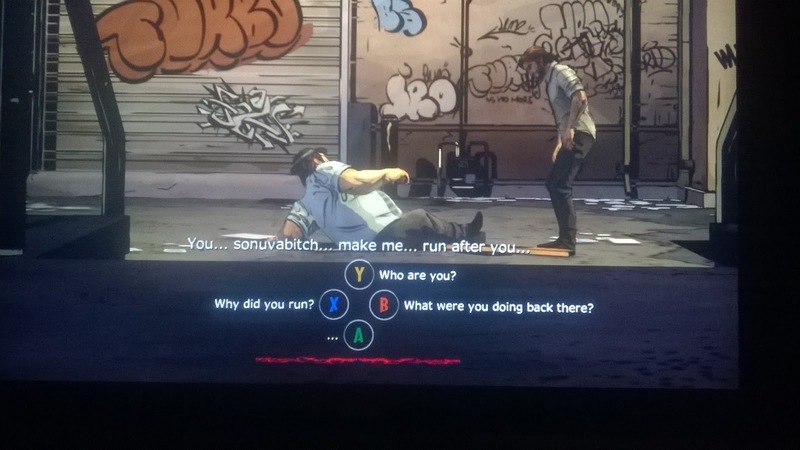 I already said I would play The Wolf Among Us because of that- however, I’ve also found two other very good reasons to play it. In terms of game settings and aesthetics, the things I love most are cel-shaded looks, the cyberpunk look, and the Film Noir setting and narrator. 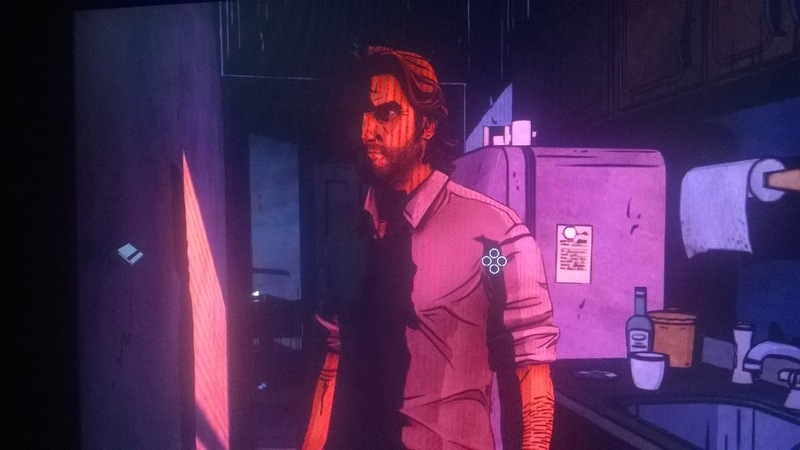 I’m not quite sure how, but The Wolf Among Us manages to wrap all of those things up into one distinctively-styled game, without it feeling like a mess or being over the top. That’s an impressive feat, as I would probably have said there was no way of combining those ideas together (while cyberpunk can be seen as modernised Noir, so they could fit each other to an extent, but combining cel-shading with them just shouldn’t work well, in a visual sense). 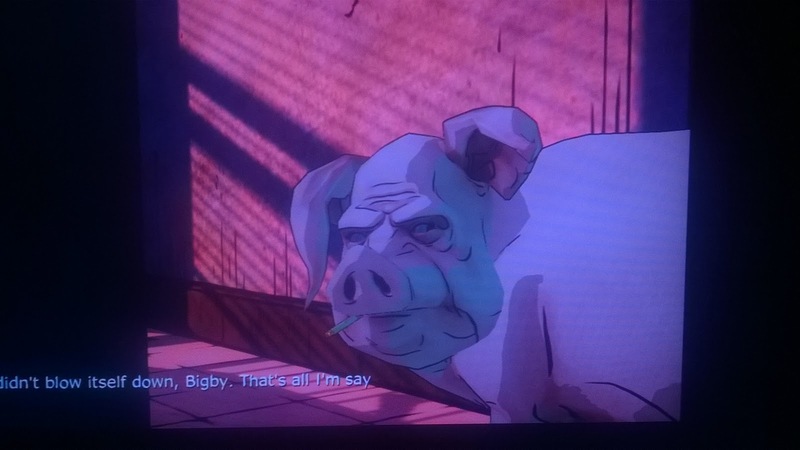 You can see from the picture of Bigby, above, that the cel-shading allows for the dramatic lighting and contrast associated with film noir and cyberpunk, creating an impressive visual atmosphere. My first impression when playing this game was “wow, it’s like a cel-shaded Fahrenheit”. (Fahrenheit, or Indigo Prophecy for non-Europeans, is a fairly obscure game/interactive movie hybrid with a lot of interesting features- anyone with an original Xbox, check it out). In terms of movement and controls, TWAU was also similar, though with less emphasis on the analogue sticks than Fahrenheit. Once I’d started actually playing, I was interested in, and made slightly nervous by, the moral choices and the idea of the game modifying itself to an extent. The nervousness is because I’m a completionist when it comes to information, and didn’t like the idea of potentially missing parts of the game- however, it has a very nice rewind system built in that makes it easy to make a moral decision, then rewind, copying the save up to just before that decision to a new save slot. Speaking of moral decisions, even though this game is based on fairytale characters, it is not for children. Case in point, Bigby’s chain-smoking, alcoholic pig housemate, as well as the opening fight resolving by putting an axe through the losers head (and other more gruesome things that would be spoilers if revealed). The moral decisions are similar to the Fable games, with textual options linked to the face buttons. Unlike the Fable games, there isn’t the “pure good” option that I like to take in games with moral decisions. It’s a pretty dark world, so even the most moral you can be will still lead to rough decisions. Currently, I’ve finished Episode 1 ( the free Games With Gold game this month), and have just downloaded Epsiode 2 to play in the next few weeks. While I doubt Episode Two will be much of a game-changer in terms of my overall opinion, I’m interested to see where the plot will develop, considering Episode 1 originally started very narrowly but then expanded without losing momentum.